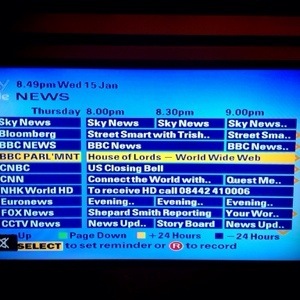 This is the speech I made in the House of Lords – leading a debate on the birthday of the web. My lords, i would like to thank all the noble lords who are participating in this debate – i must confess as the names increased, i became worried that noble lords might think i was going to give some kind of technology masterclass in the chamber. in fact, your noble lords enthusiasm and the breadth of experience that we will hear from this afternoon, is testament to the remarkable impact this relatively new invention has had on all aspects of our lives. when brent hoberman and i started lastminute.com in late 1997, i began to grapple deeply with the opportunity of the web. at that time, we were on an evangelical mission to convince investors, suppliers and customers that the web was here to stay and was not going to blowup. Imagine the landscape then – no Google, no facebook no Twitter and certainly no smartphones. All this has changed in such a short time. the uk has a long history of technology breakthroughs that we should be proud of – sir timberners lee’s creation follows in the footsteps of ada lovelace’s first computer programme in 1842 which she wrote for charles babbage’s analytical engine and the code breakers of BLethchley park who were such a central part in winning the Second World War. the web’s usage numbers now seem unsurprisingly huge – 2.4bn web users worldwide of which 1.2bn are shoppers online – put in some context the rate of adoption is warp speed. radio took 38 yrs to reach 50m users, tv took 13yrs, web took 4 and fbk took 10 months. the fastest growing web usage is in africa with nigeria hosting the largest numbers of users – 47% of whom use the web via their phone. more than 55000 projects have received funding from the crowdsourcing finance platform kickstarter – almost all of which would never have been launched without it. in the uk alone people have earnt £4.6bn from sharing their own products and services through sites such as airbnb and zopa. the web has transormed the way we work, play and interact with each other. some of healths greatest problems are being rethought. millions of so called citizen scientists are plotting cancer gene patterns via online games. Early intervention in dementia is more common after the success of an online test for potential patients. education is being opened up on a global scale through the use of massive open online courses – from khan academy’s tutorials to coursera’s degrees. all industries are being disrupted. farmers in ghana are saving time and money by using their smartphones to trade their products before the long walk to market begins and underprivilged women in South Africa are breaking out of poverty after training that means they can answer the tech problems of US customers. even the animal videos posted online – much mocked by some – are now enabling scientists to gather meaningful data from around the world about animal relationships that would never have been accessible before. beyond the hyberbole, this 25th birthday and as part of that i hope, this debate, is a good moment to reflect on all of these different aspects to the web. the uks relative position on the techology stage is a complex one. there are many areas where we lead the world. due to our location and language, the uk is a vital part of the dominant global web businessess. london is the only english speaking city in facebooks top ten as well as boasting the highest number of twitter users. Government is also making some big strides in how it embraces the web. Through the Government Digital Service, which i am proud to have played a small part in creating, the government is leading the way for open data, open standards and digital government. the govt platform gov.uk even won a design of the year award from the design museum – surely a world first! This year coding will be part of the school curriculum and all children from aged 5 and above will be taught computer science and how to write computer code: The UK now has the most visionary policy in the G8 for educating kids. There are 11 million adults who lack four basic online skills – the ability to communicate, search and share information and to do these things safely. 50% are over 65 but 50% are of working age in a country where 90% of new jobs require basic online skills and many vacancies are only advertised online. in addition only 30% of small businesses are able to transact online meaning they miss out on both savings and sales. go on uk, the cross sector charity i chair estimates there is £68bn of value to the economy if we address these adult skills. we will need to fill 1m technology sector jobs by 2020 which is looking nearly impossible from our current workforce. the number of women in the uk tech sector is actually falling as an overall percentage and yet the sector is growing in importance – if current trends are not reversed only 1% of the sector will be female by 2040.
looking around the chamber today i am sad to see that this doesnt seem an alarmist statistic. despite the governments ambition to improve our infrastructure (I welcome Maria millers announcement this morning of a fund for rural broadband) we lag far behind taiwan, korea and japan in terms of universal provision and leagues behind singapore or korea in average available speeds. i feel surprised and frustrated that only one of the top ten most visited websites in the country is local – the bbc. so although we start as many digital businesses as anywhere in the world ,we dont scale them to compete with the biggest global companies. finally, and perhaps most seriously, i believe we do NOT have the skills and understanding of the digital world at the top of our corporate, public and political elite. this leads to a lack of high quality decisions about our future – a future where so much will inevitably revolve around technology. only 4 ftse 100 businesses have a cto or digital executive on their plc boards and yet all of these businesses are facing potential upheaval. turning to whitehall the picture changes again – just think of the uk governments reaction to the snowden allegations. the political discourse lags far behind that of the US where an expert panel has looked into the NSA’s claims about the necessity of data gathering and found that only one case was solved by their bulk collection of phone records – itself a small money laundering incident. we are woefully quiet on the subject of liberty vs. security. Allegations that GCHQ and the NSA worked to undermine encryption should caution anyone who trusts the web with their medical, financial or personal records. to add to the complexity, the technology landscape is not remotely stable but is changing at mindboggling speed. we face hard questions as we grapple with the technology we already know about let alone the developmentscoming in the future. what should be the regulation of personal drones? Of driverless cars? How do we protect against increasing cybercrime? what are the privacy implications of wearable technology? what is the IP of a 3d printed object? how do we teach children about identity online? How do we protect the free flow of information around the world and avoid a balkanised web? So, how do we make sure we have the understanding and experience to debate these areas effectively? I would construct my answer by going back to what I imagine were some of his guiding principles in 1989 – from which we have strayed far. the web has immense power – i find something remarkable and inspiring every day but i agree with sir Tim that we need to talk about the web we want. we need to pause for breath, perhaps be more self consciously aware of the next 25 years. we are sleepwalking into assuming that the platform underpinning so much of our daily life isnt changing. i would like to ask the government two questions – firstly, what plans does it have to mark this extraordinary, global invention that should be a brilliant inspiration for the next wave of British inventors? and would the govt agree that a fitting tribute to Tim’s vision that the web should be for everyone, would be to review the billions govt invests annually in adult skills and employment training, to ensure that digital skills are embedded throughout society? Thanks. So much easier to read with capital letters. More of a ramble than a speech…but then the membership of the House of Lords required such skills. Similarly the World Wide Web Consortium has never understood it needs directors and actors who actually know what goes on in the real wide world to achieve Sir Tim’s excellent dream. W3C is essentially a closed shop. Visit the sad W3C Forum -http://www.w3.org/community/forum/2014/02/22/sir-tims-dream-in-the-building-industry/. The forum wasn’t even started until 2011 and I don’t think any staff member has visited it since. My last post has been superceded at least in respect of a way towards meeting your main theme.